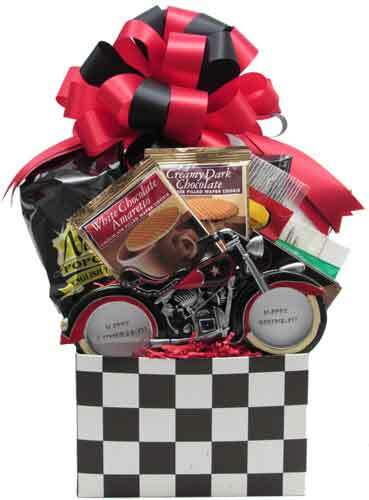 Perfect for that motorcycle lovin' person in your life! The motorcycle photo frame takes center stage in this design! Also in the design is Natural Hickory Smoked Sliced Summer Beef Sausage, Cheese, box of Focacca Crisps Crackers, Gourmet Popcorn (Pecan Almond Crunch, Cranberry Walnut Crunch, Dark Chocolate with Sea Salt Crunch, Caramel & Cheddar Jalapeno Crunch), Salted Peanuts, Hot Chile Peanuts, White Chocolate filled Butter Wafer Cookie, and Creamy Dark Chocolate filled Butter Wafer Cookie. Wrapped in crisp clear cellophane and topped off with a big colorful handmade bow. Includes a handwritten greeting card.